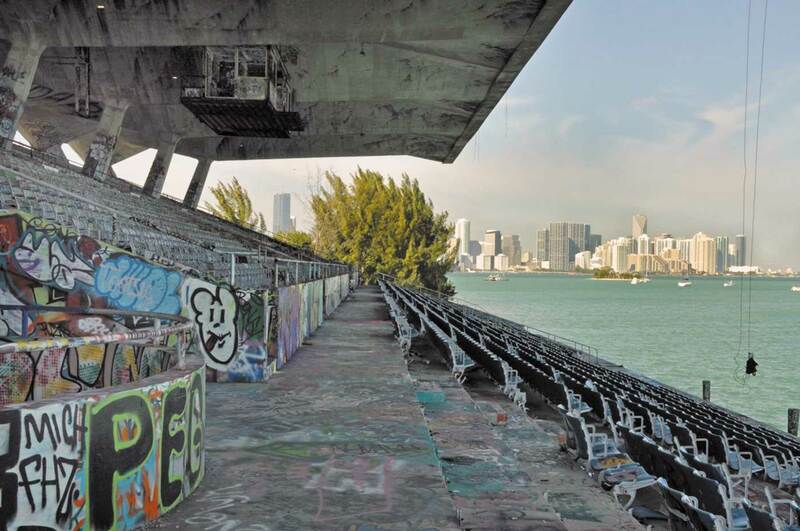 Aged, worn and abandoned, Miami Marine Stadium can be saved. That’s the opinion of the head of an architectural firm City of Miami officials plan to hire to help save the waterfront structure. At a meeting of the Virginia Key Advisory Board on Monday night, architect R.J. Heisenbottle was asked if a formal decision had been made that the concrete stadium can be restored. His response to the board: No, there is no formal determination but, in his expert opinion, the battered and graffiti-covered structure can be reborn. “We know from past experience, it is restorable,” Mr. Heisenbottle said. The city shuttered the venue in 1992 in the wake of Hurricane Andrew. Last month, city commissioners approved a $45 million bond proposal to borrow money to fund stadium renovation and improvements, along with other work on the barrier island, most of which is owned by the city. Reaching a formal determination that it can be restored, and how the stadium would be shored up, is basically what is being proposed in a contract with Mr. Heisenbottle’s company, a proposed agreement expected to go to city commissioners next month for a vote. One year ago the city issued a request for qualifications for architectural and engineering services for Marine Stadium restoration. Three firms responded. R.J. Heisenbottle Architects was ranked the No. 1 proposer and this spring negotiations for a contract began. Those negotiations reached a final proposed professional services agreement this month, according to staff memos on the matter. The selection committee that ranked Heisenbottle at the top wrote in an assessment: “The committee determined that Heisenbottle has assembled a team of design professionals uniquely qualified to comprehensively perform the required [architectural and engineering services] needed for planning, designing, and managing the construction of the specialty design work required to restore the Miami Marine Stadium to its original condition, for public use.” The committee highlighted the Heisenbottle team’s expertise in design and historical restoration services, specifically on notable structures in and around South Florida, such as the Olympia Theater (formally known as the Gusman Center), Vizcaya Museum & Gardens and the Trinity Episcopal Cathedral. “In addition, Heisenbottle’s team includes the architect responsible for the original design of the Miami Marine Stadium when the structure was built in 1963,” the staff assessment reads. “The committee members unanimously agreed that Heisenbottle’s team has the most historical restoration experience and presented a proposal specifically suited to meet the unique needs of this iconic project,” it says. Board members did not vote on a recommendation regarding the proposed contract with Heisenbottle, but several members expressed interest in the work and the eventual restoration. The proposed agreement between the city and Heisenbottle says compensation for Phase 1 is not to exceed $1,295,624.81. Phase 1 is described as: pre-design planning and study activities to include a building assessment and recommendations report, building programming, budget cost estimate and documentation of existing conditions of the structure. Mr. Heisenbottle said his team is made up of “a host of consultants” with expertise in constructional engineering, marine engineering, mechanical and electrical systems, soils, landscaping and more. The advisory board discussed other matters related to the barrier island, including the public marinas, the historic basin, native trees and more. Without a vote, board members agreed that a restored marine stadium needs a marketing and business plan. Mr. Heisenbottle said he didn’t disagree that a larger assessment area could be considered, but said the proposed professional services agreement limits his firm’s involvement in the stadium and abutting bottomlands. A “broader look” could serve everyone well, he said. In 2015, the city spent about $20 million to improve the land and submerged areas hugging the stadium as part of the city’s commitment to allow the Miami International Boat Show to use the so-called flex park and the historic basin for the popular annual event. Blanca Mesa, Sierra Club designee on the board, said it is a problem that certain city officials contemplated the area next to the stadium as event space. “It’s a very big concern. Some envision the area as big green space, while others envision big event space. There is a big conflict,” she said. Some board members have been critical of the city administration for not following through on a promise to turn the land abutting the stadium into a large green area for community activities like soccer once the first boat show there ended in February. Ms. Mesa said she was glad to see movement toward finally restoring the stadium. “We have an obligation to bring it back,” she said. She added that environmental consultants ought to be involved in the stadium restoration in order to protect sensitive areas around the structure. Lighting, potential noise and the impact on marine life should be taken into consideration, she said. Board members also discussed a new name for the area in and around the stadium, which lately has been called the flex park. Kevin Kirwin, city parks director and ex-officio member of the board, suggested putting more time and thought into renaming the area. This structure is a wonderful part of Miami History. As a native Miamian, I recall many fond childhood and adult memories seeing many concerts, fireworks, and my favorite – the boat races. At that time there was never any concern about the impact to the environment. I understand it should be considered, however, it appears that the only impact has been from time and mother nature to the structure. This is prime real estate and it would be a sin if this space does not get used and enjoyed by the public. What better way to highlight our wonderful/beautiful city. The vistas of Brickell and Downtown from this piece of property are second to none and unique only to Miami. It should be used for the original function it it was intended for! I agree. “Restored” means returning the boat races and NOT replanting the mangroves that were inadvertently removed last year– which was immediately condemned by those who don’t know the stadium’s history. That stretch was always barren because it was the area racing boats were loaded and unloaded into and from the racing basin (see pix here: http://bit.ly/2inwPEC ). Restoration also means no boat slips or boat mooring in the racing basin and the ditching of that Frankenstein monster known as the “flex park.” Remove the concrete and asphalt and replace it with grass and shade providing trees. Make it like Greynolds Park with open fields where people can do ANYTHING– and not just play soccer. This is a Miami ICON that needs to be recovered! So many activities can be done there, not only boat races. There are so many shows, recreational and aquatic activities that can take advantage of this beautiful place with great parks and areas along the shore. A Great attraction for Miami’s people and tourists!!! I’m sure that any money spent there now will be promptly recovered with so many things to do there (of course if well planned and administered correctly).